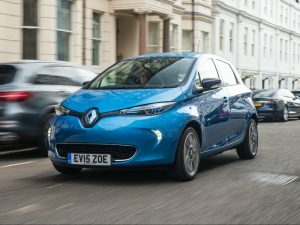 The updated Renault ZOE is available to order in the UK, now offering a 250-mile range and unlimited mileage leasing options for its new higher-capacity battery. Developed by Renault’s battery partner, LG Chem, the Z.E. 40 battery offers a 41kWh capacity compared to the 22kWh unit offered since it launched. It’s claimed to offer a range of between 124 and 186 miles under ‘real-world’ conditions, or 250 miles under homologation testing. There will be two versions available; one capable of rapid charging at 43kW, regaining 80% of its range in an hour and five minutes, the other offering a 22kW maximum charge rate, taking an hour and 40 minutes to reach the same level but tailored towards faster home charging. Faster charging adds £750 to the price. As with the 22kW battery Renault is offering customers the option to lease the battery separately or purchase it outright. Versions with the leased battery are priced from £17,845, and there’s a new £110-per-month unlimited mileage option to take advantage of its longer range. Outright purchase versions start at £23,445. All prices include the Plug-in Car Grant. The Z.E. 40 battery will be offered on the Dynamique Nav and newly-introduced Signature Nav trim levels, the latter being the first UK-market ZOE to include leather upholstery. Renault will continue to offer the 22kWh battery on the entry-level Expression trim, which is priced at £13,995, or £18,995 with the outright purchase option. UK deliveries will begin in January.